Improve the look and sanitation of any indoor or outdoor setting with this Commercial Zone 73290199 PolyTec black waste container. 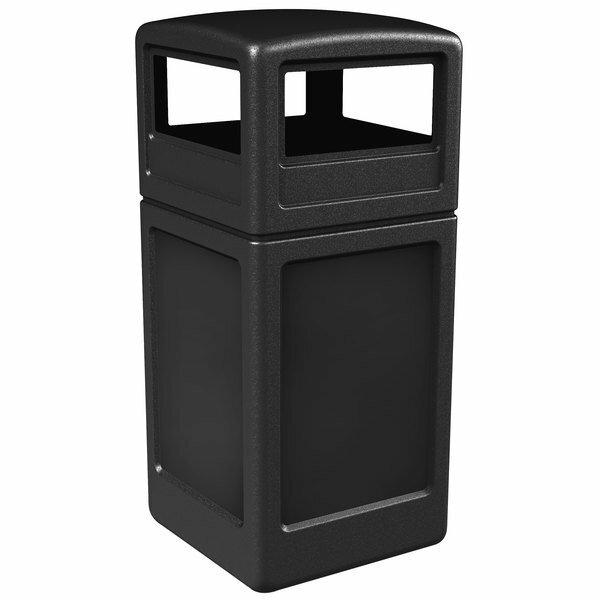 Perfect for shopping malls, cafeterias, restaurants, hotels, and more, this durable trash can pairs an attractive black color with a 42 gallon capacity to accommodate the needs of any high traffic area. A dome-shaped lid fits snugly atop the unit's frame and features large 12 1/4'' x 6'' openings on all four sides to allow for convenient disposal. Additionally, the lid works to prevent rain water from filling the bag and keep patrons from placing trash on the lid's top. An integrated "Grab Bag" system features routed openings to secure the trash bag in place, while the recycled polyethylene design is durable, environmentally-friendly, and rust-, dent-, and chip-resistant. For additional convenience, the unit's smooth exterior is easy to clean and measures approximately 1/8'' thick to ensure long-lasting, reliable use. The Commercial Zone 73290199 PolyTec waste container is an appealing, practical unit that adds instant functionality to any venue. An ADA Compliant design adds handicapped accessibility, making it usable for all your patrons. We placed this waste container with dome outside on our sidewalk. It is durable, strong, sleek and worth the money. This product is a great value.